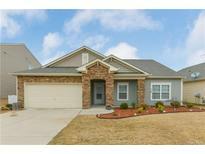 Below you can view all the homes for sale in the Glengrove subdivision located in Concord North Carolina. Listings in Glengrove are updated daily from data we receive from the Charlotte multiple listing service. To learn more about any of these homes or to receive custom notifications when a new property is listed for sale in Glengrove, give us a call at 704 604 8836. The owners' flood insurance policy is $478 annually. MLS#3480129. Keller Williams Concord/Kannapolis. Sought after & spacious 1.5 Story in beautiful GlenGrove.Built in 2010,this charmer is completely move-in ready,well maintained.Recently the sellers installed hardwoods on most of the main common living area as well as the house was freshly painted & some of the light fixtures & fans were updated.The large kitchen w/center island,new stainless steel dishwasher & stove,granite & walk-in pantry make this a great kitchen as it opens to the breakfast area!Split bedroom floor plan w/all bedrooms on the main.The master has new carpet & an enormous sized closet.Also enjoy an office w/ french doors & dining room on the main!Upstairs you'll find a 2 part bonus room that can be used as a place to watch tv & an office.Remote controlled awning over the patio & a fence grace the backyard.Located near UNCC,Concord Mills & the Concord Airport!Come take a look you won't be disappointed!Sellers are offering a 1-year home warranty for $465 from America's Preferred Home Warranty w/ accepted offer. MLS#3477015. Keller Williams University City. Community pool,Playground,Walking Trails,Pond and Recreation area. Must see ! MLS#3451061. The Firm Real Estate.